Crude oil prices remain above $60/BBL mark, and market remained careful, however crude oil closed on bullish note primarily due to OPEC production cut extension expectations along with decreasing rig count and Iraq-Kurdistan tension impact. Current crude price level is attractive enough for shale producers, as 7 shale companies have forecasted at least 10% better production from Permian Basin. This week additional bullish factors were threats from Nigerian rebels and Libyan production drop by 50,000 BPD due to ongoing strikes. October 27th 2017 EIA report depicted increase in US crude export oil to 2.133 million barrel per day from last week 1.924 million barrels a day, first time crossed 2 million level. Brent prices closed on $62.09/BBL on Friday, while WTI closed at $55.70/BBL at CME. Brent-WTI spread on Friday at $6.39/BBL. The spread is depicting US crude exportability to other locations. Brent future depicting strength closed at $62.15/BBL, $61.86/BBL & $61.56/BBL for January, February & March 2018 respectively, depicting backwardation and suggesting bullish run. CME WTI curve market closed on Friday at $55.70/BBL for December, $55.93/BBL for January and $56.03/BBL for February. EIA Weekly report reported a draw down of 2.4 million barrels with stock at 454.9 million barrel on 27th October 2017; against a market expectation of 1.4 million barrels draw down. Gasoline inventories at 212.8 million barrels reported on 27th October 2017, recording 4.0 million barrels draw against a market expectation a 1.7 million draw down. Baker Hughes rig count reported a decrease by 8 in oil rigs, with total standing at 729. OPEC is hoping for $60/BBL as new floor price for 2018, currently bullish price trend are driven through lot of reasons, which if resolved can bring back bearish tone. Henry Hub prices had a stable to bullish run through out the week as there was short covering rally along with enhanced demand on weather outlook as Pacific Northwest and North East with Chilly condition and Midwest is hot. 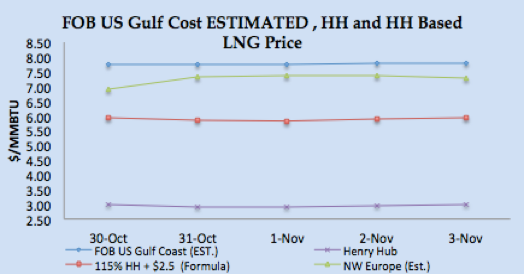 Henry Hub prices closed at $2.98/MMBTU on Friday. Another contributing bullish factor was consumption increased by 14% on weekly basis whereas supply was increased only by 1%, reported by EIA. Baker Hughes reported a decrease in natural gas rigs by 7 and total number stands at 169. Working gas in storage was 3,775 BCF as of Friday, October 27th 2017, an increase of 65 BCF from previous week, compared to expectation of increase by 62 BCF. CME Henry Hub future on Friday closed at $2.994/MMBTU for December, $3.106/MMBTU for January and $3.110/MMBTU for February, strengthening winter season based demand. 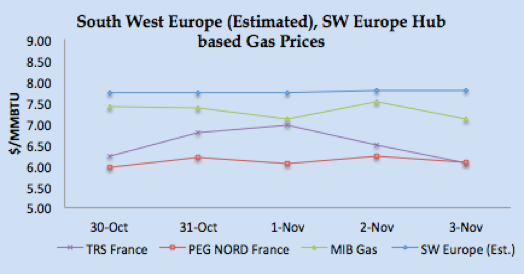 North West European gas hub prices remained bullish on colder weather outlook along with bullish coal and crude prices. NBP UK market remained bullish due to cooler weather outlook; rising crude & coal prices and LNG vessel outlook for November is uncertain. Pipeline based gas supply seem adequate right now. NBP UK Day Ahead price closed at 48.849 Pence/Thm ($6.39/MMBTU) on Friday, increased by 6.20% from last Friday. NBP UK curve market followed the spot market and bullish run is primarily on colder weather outlook, Rising coal & crude prices. Front month price closure was on 50.98 Pence/Thm ($6.67/MMBTU) on Friday. TTF Day Ahead closed at €18.10/MWH (equivalent of $6.16/MMBTU), TTF front month prices also remained bullish majority of the week, peaked to €18.46/MWH ($6.32/MMBTU) on Thursday before moving down to €18.20/MWH ($6.19/MMBTU) on Euro strengthening against USD and Sterling. South West Europe prices remained bullish due to nuclear reactors being thoroughly analyzed by authorities along with lower hydro based electricity generation in Spain on reduced water level. PEG Nord France closed at €17.82/MWH ($6.06/MMBTU) on Friday, whereas TRS France at €17.80/MWH ($6.06MMBTU), correction on news of two reactors being declared safe, and Spain at €20.89/MWH ($7.11/MMBTU). November & December PEG Nord forward prices closed downward at €18.85/MWH ($6.41/MMBTU) & €19.00/MWH ($6.47/MMBTU) on Friday primarily on weather outlook. Dollar remained bullish after Monday and FOMC meeting, which kept interest rate unchanged and concluded on solid economic growth. S. dollar index, measured against a trade-weighted basket of six major currencies closed at 94.92 on Friday after dipping to 94.50 at the start of the week. Euro remained stable on positive economic data from Eurozone, however dipped on Friday on USD strength and closed at 1.16086. AUD/USD fell on poor retail sales and closed at 0.76504 on Friday after being bullish on strong economic indicators. The People’s Bank of China set the Yuan parity rate against the dollar at 6.6397. North West Europe; winter has arrived, remained cold this week and temperature dropping next week. South West Europe: Weather in Spain and Portugal is mild and expected to remain the same next week. Latin America: Brazil is hot and expected to be hot next week with couple of days mild due to rain, while Argentina this week remained mild with same outlook for next week. Middle East weather easing a bit but still warm weather prevailing. South Asia: India and Pakistan mixed weather with mild weather, which has reduced air-conditioning demand in the Northern part. North East Asia: Taiwan easing and weather in mild range and same outlook for next week, Japan and Korea have mild weather and expected the same next week, China is cold and outlook is for temperature to move down. 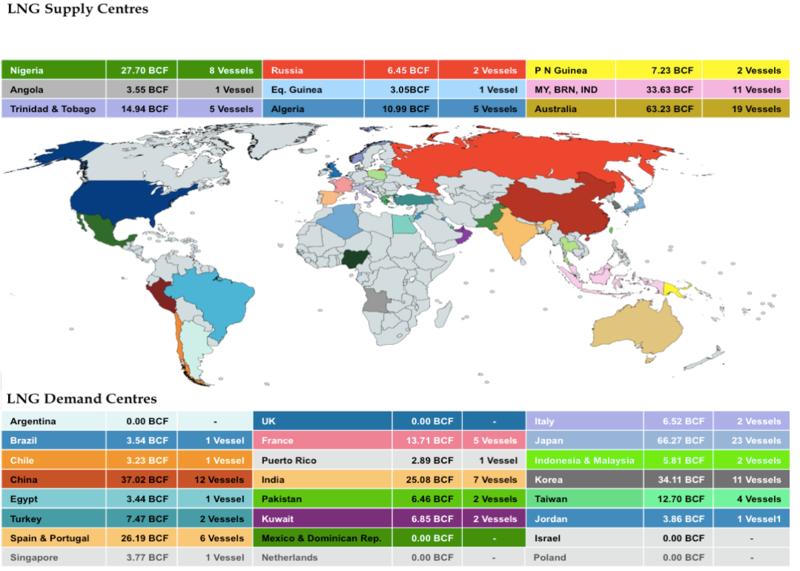 North America: Mexico is inching towards mild weather now. USA Weather: US weather remained is inching towards cold except for Midwest, which is hot. Demand for heating will be rising in Pacific North West and North East. Asian LNG market remained off color as major players still out of the market and bullish run reported in the market was determined primarily due to a deal in India and crude bullish run. Demand is expected from India for Spot cargoes due to low coal inventory level along with pan on use of petcoke along with expected return of Chinese buyers, as weather is getting cold in China. Overall trading has been thin and focus is now on January cargoes, recent strip of cargoes based upon Brent slop of 16% plus has also added into bullish sentiments. Supply is ample as Wheatstone has been commissioned along with regular supply from Qatar, US, Australia, Nigeria and Angola. Market is also watching start-up of new LNG export projects from Russia and Cove Point USA, as there is still uncertainty on commissioning. As per trading flow data, Japan, Korea and Taiwanese customers are still getting their regular contractual based supplies, and based upon 3-0-1, 14.5% Brent slope, price is around $8.00/MMBTU. 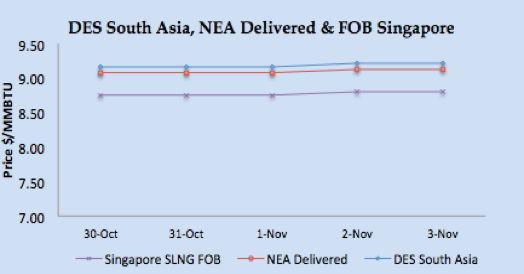 Asian price closures on Friday; SLNG NEA Delivered at $9.12/MMBTU and FOB Singapore at $8.81/MMBTU, news reported a surge to $9.35/MMBTU on Indian tender closure. 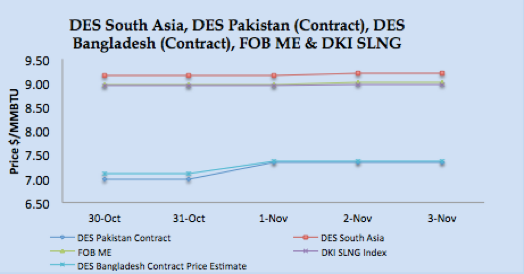 Based upon FOB Singapore and Middle East, DES South Asia is calculated around $9.21/MMBTU level. DKI SLNG Index on Friday reported at $8.97/MMBTU. On the Supply side there are adequate supply from Australia, Qatar and USA, along with spot tender from Angola Wheatstone production. JKM Future curve market jumped to $9.125/MMBTU, $9.425/MMBTU & $9.350/MMBTU for December 2017, January & February 2018 respectively, depicting winter season demand. North West European LNG prices have been impacted by bullish run of Asian prices, bullish coal and crude prices and cold weather outlook despite regular pipelined gas supply from Norway and Russia. Keeping in view Asian spot prices, North West Europe prices are remained bullish and closed at remained around $7.40/MMBTU, 60 cents premium on NBP front month prices. 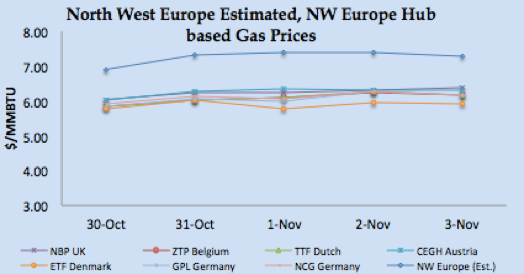 South West Europe LNG prices were high due to French Nuclear plants resumption uncertainty and lower hydro based electricity generation in Spain. 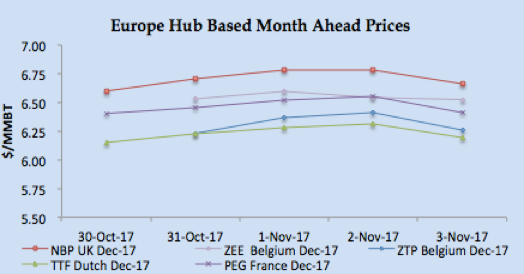 Based upon Iberian Peninsula gas hub price, PEG Nord and TRS along with Asian prices, South Western Europe prices are estimated in the range of $7.75/MMBTU. The arbitrage window still open for reloads from European ports, $7.82/MMBTU FOB is the netback price for South West European ports. US Gulf Coast producer price on FOB basis for December delivery for Asian destination comes around $7.75/MMBTU level, for European destinations the netback comes around $6.80/MMBTU level. There is demand heard from India, Brazil and Turkey for December cargoes plus Pakistan issue another tender for February cargoes for the second terminal. LNG prices currently bullish run is primarily due to recent closures news from India, along with historical trend of winter prices and bullish Brent prices. Market is expecting China to be back in the market for January cargoes, along with maximum procurement of contractual volumes from Japan, Korea and Taiwan. Supply situation seems adequate, however we expect a bullish run if China back in the market. 88 vessels carrying 6.03 million tons (289.75 BCF) loaded from various supply centres, during the week from 28th October – 3rd November 2017. 22 Vessels left from Qatar carrying 78.85 BCF for India, Pakistan Korea, Japan, China, U.K. and Latin America. Eight vessels carrying 27.70 BCF departed from Nigerian port, for Japan, Korea, Mexico, Spain and Atlantic basin destinations. Algeria loaded five vessels carrying 10.99 BCF for Turkey, France, Spain and Japan. GNL Del Plata, FSRU, loaded from Qatar with commissioning cargo for its final destination Uruguay. Pont Fortin, Trinidad & Tobago loaded four vessels with 14.94 BCF for Dominican Republic, Taiwan and Jamaica. 11 vessels loaded from Brunei, Malaysia and Indonesia with load of 33.63 BCF for China, Japan, Korea, Singapore, South Africa and India. Nineteen vessels left from Australian export terminals of Dampier, Darwin and Gladstone ports for Japan, Taiwan, China and Korea carrying 63.23 BCF, resumption of loading from Curtis and Gorgon. Five cargoes left from Norway with three small cargoes and two for UK and Turkey. One reload, 3.76 BCF left Fos Sur Mer, France for Asian destination. Two vessels left from Sakhalin, Russia for Japan & Taiwan carrying 6.45 BCF. 8.47 BCF loaded into 3 vessels from Cheniere Sabine Pass for Mexico, Atlantic Basin and Asian destination. 91 vessels carrying 5.64 million tons (269.33 BCF) discharged at various ports the week from 28th October – 3rd November 2017. Japan being the biggest importer with 66.27 BCF and 21 vessels discharged, regular volume as per last week. North East Asia block comprising of Japan, Korea, China and Taiwan discharged 150.15 BCF (50 vessels) approximately 55.75% of total discharged global volume during the week. India receives 7 vessels with 25.08 BCF from Qatar, UAE, Netherlands and Equatorial Guinea. Pakistan received two vessels from Qatar. France receives 5 vessels with 13.71 BCF, from Algeria and Nigeria. UK hasn’t received any LNG vessel in last two weeks. Spain received 8 cargoes with 23.37 BCF from Qatar, Peru, Algeria, Angola and Nigeria. Turkey discharged 7.47 from two vessels, one each from Algeria and Trinidad & Tobago. China received 12 vessels with 37.02 BCF and last week 36.15 BCF, with total of 23 vessels in last two weeks. Disclaimer: This is a personal analysis based upon public information and should not be used for buying and selling of commodities. Source: SGX LNG Index Group, EIA and Reuters.